As Milgard's 2017 Dealer of the Year, we invite you to See the Sivan Difference. Our many years of experience allow us to easily know the needs of each and every one of our clients. We can assist in helping you choose the perfect window or door plan to fit your personal and home needs. We will provide your home with green energy to help you save money. Sivan is committed to your satisfaction. Reseda, Encino, Canoga Park, West Hills, Hidden Hills, Calabasas, Tarzana, Sun Valley, North Hollywood, Studio City, Beverly Hills, Bel Air, Santa Monica, Granada Hills, Northridge, Chatsworth, Agoura Hills, Simi Valley, Thousand Oaks, Moorpark, Malibu, Glendale and Los Angeles. SIVAN WINDOWS & DOORS is rated 4.6 out of 5 by 11. Rated 5 out of 5 by Billyb31 from All windows done - Fantastice!! We hade 14 windows done and they did a great job, professional and the crew was friendy. I was expecting a 2 day job but they busted it down and did it in a 1/2 a day. Need windows this is the place. Rated 5 out of 5 by mMedill from Whole house windows and doors remodeling We could not be happier with our new windows and doors installed by Sivan Windows and Doors. The project started at 9am on a Saturday morning and finished at 5pm Saturday evening. Yaniv was more than helpful and very knowledgeable about the Milgard products. I highly recommend this company! Rated 5 out of 5 by Evans12 from Personable and Professional Sivan Windows and Doors provided me with professional and personable service. They delivered me a quality product and were patient and spent quality time in knowledgeable consultation. I highly recommend this company and commend them for their hard to find integrity and hard work. 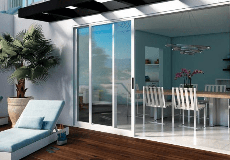 Sivan Windows and Doors cares not only about their product, but also about their people. This characteristic puts them several notches above their competitors. Rated 5 out of 5 by JennyMarie0597 from Competitive Pricing We used Sivan Windows & Doors for a bathroom remodel project. Yaniv came to the house within a week and gave us a estimate the same day. I highly recommend this vendor and will use them again for future projects."